International Center of Photography Curator Kristen Lubben discusses her recent book and exhibition Magnum Contact Sheets. 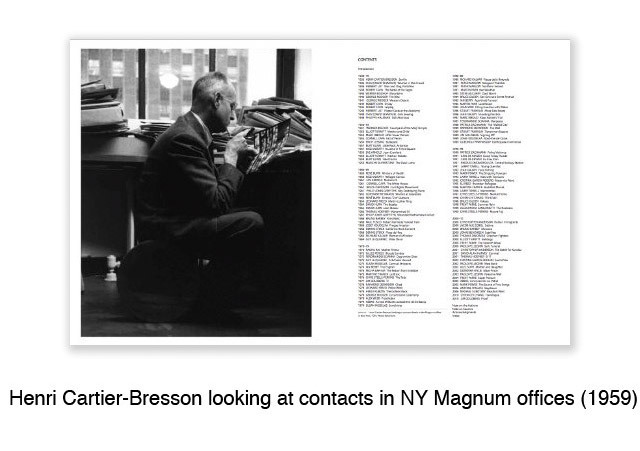 Russet Lederman: How did the idea for the Magnum Contact Sheets book develop? Kristen Lubben: The idea of archives was on everyone’s mind, partly as a result of the New York Magnum office having just sent their “working prints” archive to the Harry Ransom Center at the University of Texas. Thames & Hudson and Magnum approached me as editor and curator of the project, which they had conceived together. They came to me because I had recently completed a book with Susan Meiselas (In History), which had been very heavily archival based. Also my earlier book Amelia Earhart: Image and Icon focused on the process of editing and circulation of images; I was also at the same time engaged in working with the recently recovered negatives in the Mexican Suitcase. These projects cast a wider net in terms of the kind of materials one can consider when looking at photographs, and Thames & Hudson thought I’d be a good fit in terms of my approach and interest in working process. RL: Who else was involved in shaping the book’s focus? 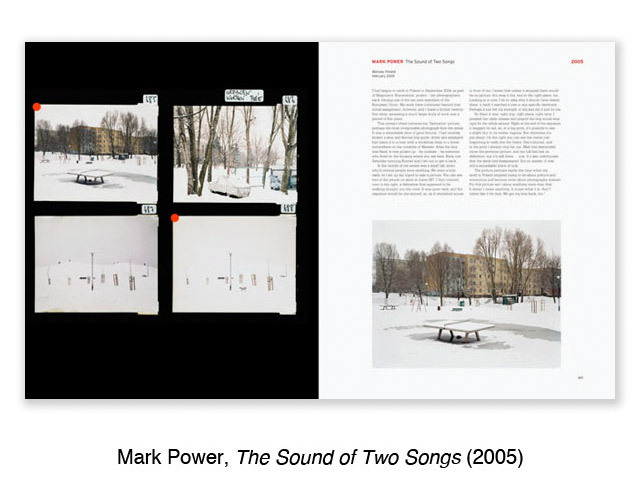 Kristen Lubben: Martin Parr was the photographer representative on the project and was a guiding force throughout. He was the person who really identified that the contact sheet would make a good subject now because of the transition to digital. We were meeting in Paris to do the first edit and he just sort of tossed out the comment that the book would function as an epitaph to the contact sheet. His words really stuck with me and gave me a lens through which to see the project and its timeliness. None of us think that any of these things are going to end, but of course they are. The design of the book mirrors the look of the Kodak paper box, and it was a little eerie that the Kodak bankruptcy was announced on the same day as the opening for the show that is associated with the book. RL: You decided to sequence the book in chronological order. Why? Kristen Lubben: It was crucial for distinguishing this book. We wanted it to be about Magnum, the agency and its photographers, as well as about the development of the medium over time–the larger arc of history. The book is an homage to a way of working. RL: Can you discuss why you decided to include a variety of analog film formats: 35 mm, slide, large format and panoramic? Kristen Lubben: It was important to show the range of material, since Magnum (and contact sheets) are probably most associated with black and white 35mm. Nothing in the book was shot on digital; everything is film or analog. There are a few instances where we blur the edges: Mikhail Subotzky digitally edited his project, but it was shot on film. We also included color slide sequences, which, while not technically contact sheets, are similar to film in that both are about the process of editing. Everything shifted when color positive came in. It was a different way of working, because the photographer would do an initial edit of their slides with an “A” box, a “B” box, a “C” box, and only give over a certain cut of the images to the agency. This is the first loss of not seeing absolutely everything, since the agency editor no longer made the first cuts—it’s a precursor to what happened with digital. 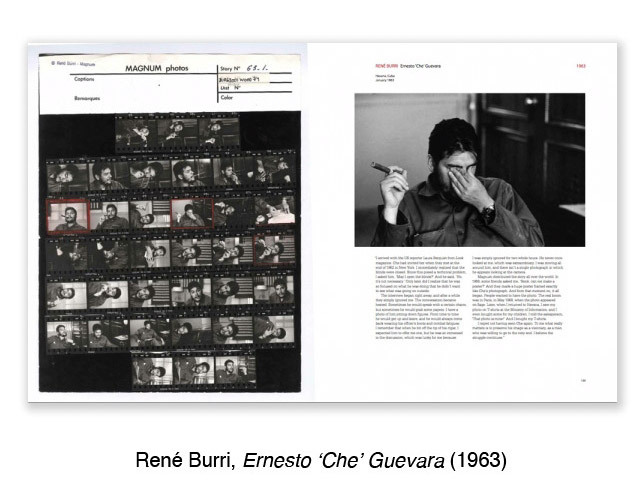 RL: How did you select the contact sheets used to represent each Magnum photographer? Kristen Lubben: We began by inviting all the photographers to send us 3 suggestions, which could either be their key image or a surprising lesser-known image that had an interesting story behind it. Most of the time the selections were spot-on and were absolutely what we want to use. Sometimes they were a surprise — a great image didn’t necessarily have a great contact sheet. There were also cases where maybe an image wouldn’t pop out of somebody’s top 5 most famous photographs, but had an especially interesting contact sheet. That was the case with the two Chris Anderson examples in the book — particularly the Afghanistan one. Contact sheets are not just about zeroing in on that key image, but also about revealing a way of working and how our understanding of an image can change over time. RL: If the contact sheet can also be seen as a teaching tool, then what will young photographers now use to learn about the working process of older and more established photographers? Kristen Lubben: I think they are missing out on that opportunity. Hopefully the book will be used as a teaching tool. I think one of its really strong benefits is that opportunity to see how someone else works. A huge question with digital material is what happens to all of this overwhelmingly massive volume of digital material that isn’t perceived to be the top tier or the final edit? There is so much digital detritus, and nobody knows at this point what is going to happen to all of it. In the past, you used to have a packet of letters with a ribbon around them in your dresser, and now it is all email and so ephemeral. I think there are so many questions here. Contacts are more than just a teaching tool for working process. They are also a reminder of the value of history and the need to preserve archives. Hopefully when people look at the book they will realize what’s happening today and what we are losing? I hope it will make people mindful of the importance of preserving history. RL: You curated a show at ICP based on the book. What were some of the issues you had to consider in translating the book format to the walls of a museum? Kristen Lubben: I view the book and the show as separate entities. I think because of the small physical scale of the exhibition, I had to see it as something that would be a portal to the book. The biggest challenge was scale: both the scale of the room, as well as the scale of the contact sheets. I’m very glad that I chose to blow the contact sheets up. I want to encourage the viewer to get up close and personal in the same way as with a real contact sheet. With a book, you can get as close as you need to, but you can’t do that in an exhibition—the enlarged scale of the prints bridges that distance. I wanted to do something that wasn’t just imitating the book, but added a different dimension to the viewing experience. RL: In the show you don’t emphasize the chronology, while you do in the book. Can you speak to that curatorial decision? Kristen Lubben: Because the show is so compact, it is hard to sketch out something that is a real history of the medium. Instead I decided to pick really interesting examples –contact sheets that are either visually engaging or have a good story behind them. In the book, we are pretty religious in every case about showing the contact sheet and its key image. I didn’t do that in the show because I felt like it would eat up too much space and give the prints too much importance. Where I did include prints in the show it was more about trying to add something different to the story, rather than just show what the key image was. For example, Robert Capa’s “D-Day,” an image not on the contact sheet, is included because it highlights the story about a negative that is missing. 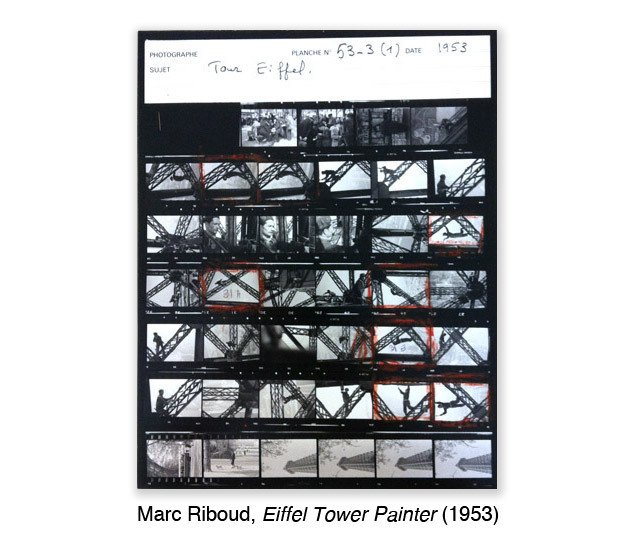 With the René Burri, it’s the verso of one of the contact sheets, where you see all those stamps and get a sense of how these were real working objects. The Jim Goldberg is a unique collage. RL: Are you going to continue to work with Magnum? Kristen Lubben: Absolutely, for somebody who is interested in photojournalism, documentary and socially engaged photography, there’s no better group to work with. They are some of the most important photographers, working in ways that perfectly align with my interests. I think Magnum is just an amazing and unique organization and it has a close and intertwined history with ICP. This entry was posted in Exhibitions, International, Interviews, New Acquisitions, Unpacking the collection, Visual Research and tagged Cartier-Bresson, Contact Sheets, Eve Arnold, ICP exhibitions, Jonas Bendiksen, Kristen Lubben, Magnum, Magnum Contact Sheets, Marc Riboud, Mark Power, Martine Franck, Peter Marlow, Philippe Halsman, Rene Burri, Russet Lederman, Trent Parke. Bookmark the permalink. Love Contact Sheets.seeing the before and after of a series. They reveal so much about selection, seeing, anticipation.